Each icon has a motif comprising blue and red fields with white stars on the blue field. 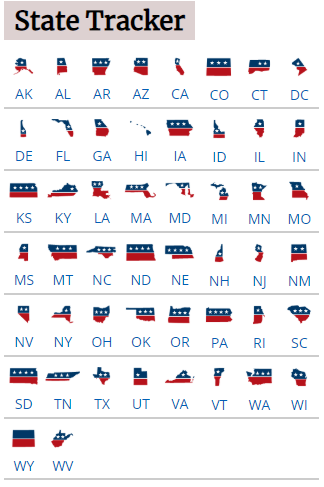 I am wondering what, if anything, is the significance of the number of white stars for each state? In particular, why does Wyoming have no stars? I thought it might be stylistic - use as many stars as fit nicely in the blue space - but Wyoming doesn't follow that principle (nor does Connecticut and Utah though they at least have some stars). Another possibility might be to differentiate the icons (Wyoming with three stars would look like Colorado with three stars) but that doesn't seem satisfactory either since either could have two stars and be unique, and there are others that look similar and have the same star count. Browse other questions tagged united-states election flag or ask your own question. Why does the election worker cover the slot on a ballot box? To what degree have Wikileaks influenced the 2016 US election? Do state senators and representatives have offices in Washington DC or in the state capitol?